More than any other member of the Dark Shadows cast, Jonathan Frid's likeness has been featured on a wild array of collectibles. His image has appeared on bubblegum cards, books, magazines, pillows, models, boxer shorts, Christmas ornaments, and more. 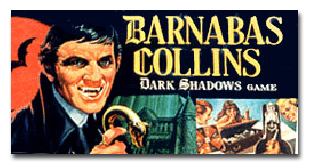 While I researched my first DS book, The Dark Shadows Collectors' Guide (Clique Publishing 1991), I interviewed Jonathan. He mainly discussed his career, including the one-man shows he was performing throughout the U.S. at the time. But in the following excerpt from the interview he talks about the DS collectibles. 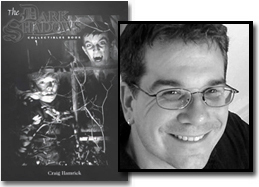 Craig Hamrick: Do you own any of the memorabilia that was released in connection with Dark Shadows-like the books or games? Jonathan Frid: No, I'm not a collector really. I had some of it, but it's either disappeared or in a trunk somewhere. I've found after all these years that anything I collect is just something that has to be dusted off every six months. So I decided to get rid of all this dusting work. (He laughs.) So I don't really collect. Sorry to disappoint you there, but I'm not really into it. I have a portrait of me that was done by a fan, oh maybe 10 years ago, and actually it's very good. I have it hanging. But, other than that ... No I don't want to be a Bela Lugosi. I understand that he kind of wallowed in his vampirism. JF: That was my impression anyway -- from what I've read -- that he was buried in his cape and all that. No, I like to move on. I'm no different from anyone else. We're all a little nostalgic and we all move on. I don't linger too much. CH: What did it feel like to suddenly see your face on all that memorabilia: books, bubble gum cards, posters, and all those kinds of things? JF: Well, I was flabbergasted, but I wasn't exactly proud of it. I was (proud) in the sense that I was getting a new reputation. I remember someone was here in New York from Hollywood one time. They were organizing a fan club. I mean these were professional fan people. They had an organization that handled all the big Hollywood stars at that time -- Steve McQueen, and so on. They said, "You know, whether you like it or not, you are now a celebrity and you always will be for the rest of your life." I really don't envy the superstars at all. In fact I feel rather sorry for them, except that some of them enjoy it. I shouldn't really feel sorry for them, because most of them do enjoy it or they wouldn't become superstars. I just became sort of a minor star by accident. And I don't know how to play it. I don't have enough...savvy. I'm clumsy with it. CH: Did you get a chance to see the book covers, or the comic books or any of that before it was published? Did you have any pre-approval of the items that had your picture on them? JF: No, they just rolled right over my head on that. I almost wanted to get into court about one thing. There was a comic strip for a short time in The Daily News. They were literally copies of photographs, not even comic strip characters. They were literal likeness of me. And I thought I could probably go to court over that. But, (he laughs) there I was, I got my face in the comics, so I can't complain. 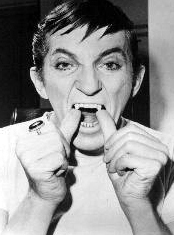 CH: Did you get to keep any of the props from Dark Shadows -- the fangs or the canes? JF: No. Of course, I kept losing them anyway. I lost two or three canes. I was out on these tours, and like I lose umbrellas, I would lose the canes. And the ring I lost two or three times. But you know the original ring was... All these fans have got these expensive onyx rings, and the original ring on the show was not even onyx. It was a cheap, Woolworth's, green thing, and they painted it black. It was just a tacky old thing. But then I've started to see all these glamorous looking onyx ones that the fans have. I didn't even know what onyx was before I was on that show. Once I left my fangs in a john at an airport. 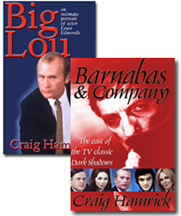 In the early days when I was out on these junkets pushing the show, I used to pick up a couple of thousand a weekend, which in those days was a lot of money. And it was sort of fun. The only problem was I had to be back, with my nose to the grindstone, Monday morning with my lines learned, so I never had a chance for any of this to go to my head. None of this ever went to my head because I was too busy. And I was very humbled, because I was a slow study. I was the worst person on the whole show learning lines. JF: Oh, nobody compared to me and the difficulty I had. I was just slow. I've always been a slow learner. Anyway, I'd be out on these weekend toots on the countryside. I was in Michigan or someplace, and I'd have to bare my fangs. In those days I wore the cape and I had the cane, and I fixed the hair in those silly little points. And I'd taken the fangs out to rinse my mouth out in the john, and I'd forgotten all about them. And I was on the plane before I realized, "My God I've left my fangs behind!" And somebody turned them in. They thought somebody had left their denture and so no one was the least bit surprised by the look of them. They simply put them in the lost and found. Somebody from ABC called, and there they were. So they sent them mail express or whatever back to New York. CH: What did they look like? JF: It was just the fangs. It was like an upperplate. It was like a wire thing. No one in the world would know what they were, and someone found them. So I got them back. CH: After they did a lot of traveling. JF: Yes. That's another reason why I don't collect things. I'm always losing them, or someone's borrowing them.